Julian is widely acknowledged as one of Europe’s finest wildlife painters yet he left Belfast College of Art after only one term choosing to learn his craft through personal experience and endeavour. He held his first solo exhibition in 1977, was elected to the Royal Ulster Academy in 1995 and was its President from 1999 to 2002. In 1996 he embarked on a major commission by the International Foundation for the Conservation and Development of Wildlife, a group centred in the middle east. This involved the painting of thirty two large canvases featuring desert wildlife which would then illustrate a limited edition book. The project, and book, was entitled ‘Gifts from the Desert’ and in 1999 the original artwork went on tour internationally. Julian’s interest in conservation in the middle east continues with further projects in progress. 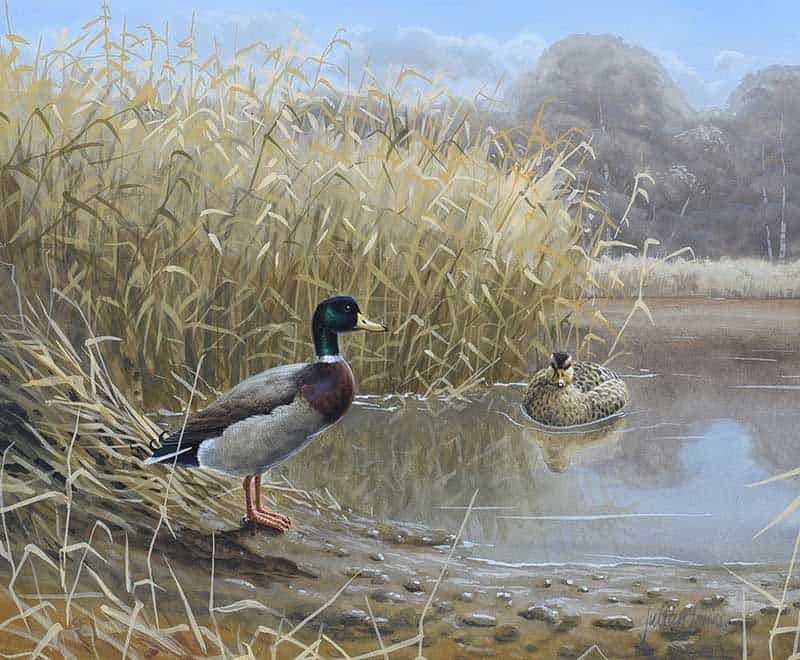 In 1998 he was commissioned to design the first Irish Duck Stamp for the American Duck Stamp Programme. Apart from numerous one man shows, Julian, an active conservationist, has exhibited in group shows, alongside the world’s most important wildlife artists, in the natural history museums of London and Bonn as well as in projects in the Netherlands and America. He continues to live and work in N. Ireland near its Atlantic north coast.